The Uganda Registration Service bureau (URSB) has cautioned couples about disregarding marital registration rules when conducting marriages. This caution was given during a three day workshop in Masaka Town for the duty bearers responsible for solemnization and registration of marriages in the Greater Masaka Region over the weekend. The workshop attracted about 200 duty bearers including; chief administrative officers, town clerks, senior assistant secretaries, community development officers, Christian and Muslim Religious leaders. The group was trained in areas of marriage registration and their general roles as registrars of marriages to empower them deliver on their respective mandate. Mr Charles B Nsimbi, the manager of civil registration at URSB said celebrating marriages in places that are not licensed is an offense punishable by law and cautioned the public to desist from this practice. Nsimbi said the certificate issued by churches, mosques and other places of worship has no evidential value until the respective marriage is properly filed with the Registrar of Marriages as provided by the Marriage Act. “This is done by the marriage celebrant transmitting an official letterhead from the chief administrative officer, the duly licensed Church, Mosque, Temple or other authorized establishment; and a certified copy of the marriage is registered by the civil registry,” he said. Ms Zeuse Kizza, a legal officer at URSB said before issuing licenses to churches to wed couples, URSB has to first access the physical outlook of the church structures adding that the license is issued to only places which are safe and cannot put peoples’ lives at a risk. “It’s not a must to get a license to allow a place of worship to celebrate a marriage, but if a couple weds in a place that is not licensed, the marriage is null and void” She said. She said that a registered marriage is a safeguard for spousal benefits like insurance, pension, citizenship, immigration, emigration, family re-settlements as well as inheritance of estates upon the demise of a spouse. Ms Kizza however said mosques don’t require licenses to celebrate marriages since the Sharia law explicitly tells the Muslims, what to do at every point in a marriage, adding that Muslim marriage cannot be converted into a civil marriage since they are governed by different laws . 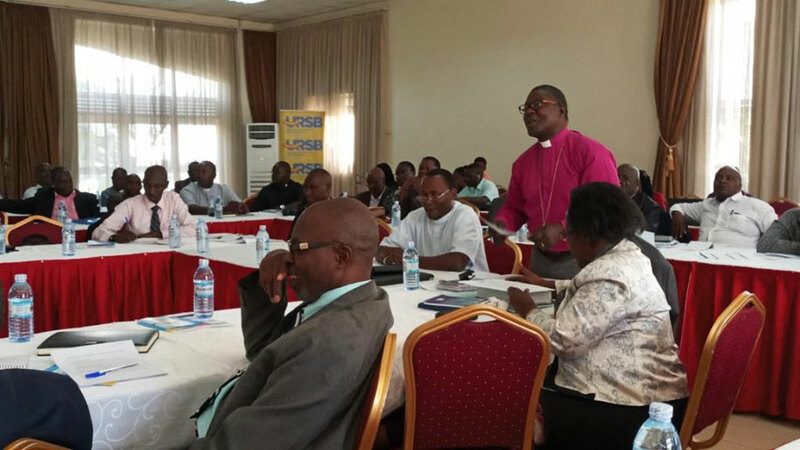 West Buganda Bishop Katumba Tamale said registration of marriages will help much in developing a data base for married couples in the country and called upon people to embrace it. He however raised concern over the Shs 35,000 which is supposed to be paid by a couple to register a marriage for people that are too poor to raise this fee. “ We are at times prompted to make mass weddings because people don’t have money to conduct an individual wedding. I ask government to consider removing this fee in some cases where people can’t raise this money,” he added. Masaka Resident District Commissioner, Herman Ssentongo, who was the guest of honor asked URSB to conduct more sensitization campaigns to teach masses the advantages of registering marriages and what happens if they cerebrate marriages in unauthorized places of worship. The Mr Alex Aganya, the URSB Registrar General revealed that URSB is considering introducing a digital platform for chief administrative officers and religious leaders to file marriage returns from their offices and further address the hassle of carrying hard copies to URSB offices in Kampala. Recognised marriages in Uganda: These are customary, Muslim, Church, Civil and Hindu marriages . Customary marriage: These are celebrated according to the cultures of different groups of people. Muslim marriages: These are celebrated in accordance with the rites and observances of the Muslim faith, between persons professing the religion. Church marriages: Are celebrated in any licensed place of worship according to the rites or usages of marriages observed by a particular religious denomination. Hindu marriages: They are celebrated between Hindus. Civil marriages: Are celebrated in the offices of the Registrars of Marriages.